When we’re given a task to design a solution for a problem, we generally follow a design process that we feel is the most apt for such a problem statement. During the course of following such a process, we might hit roadblocks or creative blocks, where we wouldn’t know how to proceed any further. This is where we look for inspiration. Inspiration from other people and how they have solved a similar or maybe even the same problem statement. So, where do we look for inspiration when we’re like a lost puppy in a pile of haystack? The cliched way would be to look at existing applications we’ve used and note how they’ve solved a similar problem that we’re designing for. Honestly, there’s a lot more to finding a solution from an existing application than just looking at it and blindly replicating it. When you pause for a moment and think about it, it makes A LOT of sense! All your life experiences will greatly influence how creative you are in the field of your expertise. To be creative, you just have to see what others have failed to notice. Travel to a new place. Every now and then. It can get both physically and emotionally draining to work 8 hours a day. The mundanity could get a little too much where it directly affects the design work you produce. Traveling to a new place every few months not only gives you the breath of fresh air that you require from the overly polluted cities that we live in, but you gain new perspective to your life when you meet new people from different walks of life. During my trip to Masai Mara in Kenya, I had the opportunity to visit a village inhabited by the indigenous Masai people. Most of them were at least six feet tall and dark, veiled in bright red colored clothing. Do you know why they wear red? Because the predators that prey on their cattle will notice them easily where they carry a huge spear to attack them if they get too close to their cattle. So, every new place you visit, is going to teach you something you hadn’t known before. It’s time to go out and explore. There has to be something different which we have to engage in after work. Something totally different from your field of expertise. It helps in giving rest to the part of your brain that was mostly active during your working hours and activate the other part which was mostly idle. No, by hobby I don’t mean binge watch Narcos or Grey’s Anatomy. To do that you still have to stare at a computer screen which you have done enough for the major part of your day. Origami - There’s something calming in folding a plain sheet to paper into something 3D and tangible. Try it yourself to feel the difference. Paper Toys - Makes a fun little desk toy which you could stare at during the times of your personal reverie. Baking and Cooking - At times, designing is just like cooking or baking. You add different ingredients together in a certain proportion to create something delicious (hopefully). If cooking can’t make you more creative, I don’t know what will. 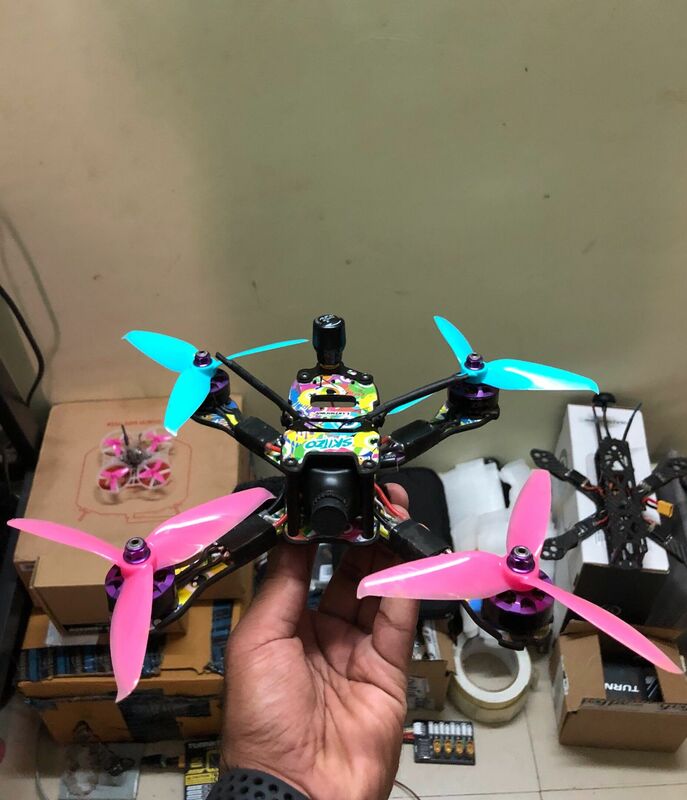 Building Racing Drones - You have to learn to research, solder, tighten nuts, fix your fried electronics when you crash and try not to cry when you have to spend a bomb to fix it. Apart from that, you have a heck lot of fun while flying it. Notice the different colored propellers(aka coloful blades)? Wondering why? While flying the drone, it’s difficult to to differentiate the front from the back. So, I use different colored propellers to find out the orientation. I will probably be able to connect this with some of my design work. Still not convinced? Check this out, if you want to explore other hobbies that could inspire you in different ways. There seems to be some connection between the music you listen to and your design output. I produce better design work while listening to music than when I’m not. Some songs lets you sync right into the tune when you get a flow and feel for it.